US producers simply don’t play along with OPEC and Russia. WTI really does look like it is about to collapse. Let’s be clear, I am not necessarily talking about a return to the sub-$30 of the beginning of 2016 here, but a return to the more recent lows around $42 before too long is distinctly possible, and if that happens, who knows where we go from there? There are, as I have noted in the past, reasons to believe that the long-term path of oil is still upward, but more immediately there is one dominant factor that keeps adding downward pressure, large and still growing supply from North American shale producers. The chart below indicates why American producers are pumping at a growing rate. WTI has been recovering ever since the low of $26.05, and is now at levels not seen since June of 2015. There are reasons for that recovery, most notably the production cuts agreed by OPEC countries and others including Russia and improving global growth, but those bullish factors are now fully priced in and the effect of that is to encourage U.S. E&P companies to, to borrow a phrase, drill, baby, drill! There are, as I said, some bullish factors, and there is always the chance of a major unforeseen event disrupting supply; but all else being equal, the next big move in oil will be caused by the most basic driver of price for any commodity; the balance between supply and demand. As it stands, every increase in demand and attempts at reduction in supply outside the U.S. is being more than compensated for by increases in domestic production, and eventually the price must reflect that, despite a continued positive outlook for economic growth. Blaming “a significant decline in orders,” GE Power started implementing layoffs in two locations in the US. Read… US Demand for Electricity Falls Further: What Does it Mean? The congressional vote to sell arms to SA was not as enthusiastic as in past administrations, perhaps Congress has suddenly found a soul or conscience? Well, the measure still was passed b/c obviously, supporting the USMIC is all about business ethics. What are the S.A. arms being purchased for anyway ? Invading neighboring countries with rich oil fields, or capturing oil tankers that haplessly wander by ? Oil and its derived products is certainly expensive for S.A. no matter what is happening in the R.O.W. S.A. Is using US arms against it’s neighbor, Yemen. I think its also a case of selling something that has no immediate practical purpose, for a lot of money, as part of a quid pro quo. You buy our extra overpriced military hardware, in exchange for political considerations, the US maintaining the status of the petrodollar, and a market for Saudi crude, for instance not developing domestic energy resources, or perhaps curtailing subsidies on renewable energy, or not opening up Alaska, or backing out of the climate accord. SA is using arms to fight Iran and its various Shia Middle East proxies. That used to be Iraq’s job we unwisely toppled Saddam. Correct, shale oil-and-gas has accumulated negative cash flow of about $250 billion since the shale boom started, and yet production has soared, and Wall Street keeps funding it to the tune of tens of billions of dollars a year, in equity and debt funding. In 2016, shale oil drillers raised $40 billion in equity funding alone — and drilled this money into the ground. This year, they’ve been doing the same thing. As long as Wall Street keeps funding these negative-cash-flow operations, production will continue to surge and the price will stay low or drop further. Watch the money that goes into the industry. There won’t be any kind of peak in production until the money dries up. The money dried up very briefly during the oil bust, and production fell. But money started surging back into it in 2016, and production is rising again. See the first chart above. So watch the money. That’s what matters in oil and gas. Not MIT theories. And production will continue to surge until the money dries up again. This makes perfect sense as an explanation as to how the industry keeps going. Too much money in the system has to find a place to land so it ends up financing high risk ventures. In essence the government is subsidizing US oil production. Under such a senario peak oil could be a long way off. yes, as interest rates start rising ‘watch’ the money…….kind of like funding tech unicorns, also shale o&g ‘supply’ in the u.s., is by its physical & geographic nature ‘short term’!!! Not that I know anything for real. (Just a monkey writing firmware). But appears to me that a combination of the great recession and low real returns has lead to a totally broken credit channel. Functional credit channel: returns are recycled back into the credit channel. Those returns then guide where the credit is directed. Broken: Central banks pour liquidity into the system, but none of it is recycled, which means there is no good feedback to guide the flow of credit. By money you mean debt. The US still has some value as tangible assets, but debt creation is number one. Shale fossil fuels are the “start up of the energy industry”. This can only be supported by debt creation. The first peak oil prediction was by an expert, Kellog, in the 1870s. Also it would be unlikely any oil would be found outside Ohio and Pennsylvania. How much oil production is there in Ohio these days? It isn’t sarcasm. It was believed that once the oil in Ohio and Pensylvania was depleted no more oil would be found, anywhere. It didn’t take long to prove this to be nonsense. Rockefeller was advised in the 1870s to diversify his business into endeavors other than the oil business to prepare for when the oil ran out. There’s a whole history of alarmist predictions that oil production had peaked and was running out – in the late 1970s – early ’80s, according to experts, and reported in newsmagazines and newspapers we were going to run out of oil by 1987 (just in time for the New Ice Age, another big worry-story of the time). Of course all these predictors just took reported reserves, divided by annual consumption, and that was how many years we had left. The ‘running of of oil/oil glut’ story is like the ‘global warming/new ice age’ news cycle. But if it makes people worry, then the experts and the media have fulfilled their purpose. Oil just topped on its intermediate cycle. It’s definitely going lower, but I see it heading back into a basing pattern, not going below 47. Of course if that causes some of the highly leveraged small drillers like XCO and PGH to proceed into BK…..then so be it. A shale consolidation is definitely a recipe for much higher prices in the future. The future of autonomous/all-electric cars is much father off in the distance that what we’ve lately been led to believe. Our Saudi “9-11” allies are just proxies for the War Party Of The Rich in Washington . He’s missing a critical point here: it could all come crashing down if the money spigot got turned off or if interests rates rose to historical norms. Much or most of this shale oil is produced at or below production costs. It continues because the Federal Government, the Central Bank, and the speculators want it to. In one of those hypothetical “free market” societies that so many of those speculators and professional economists drone on about, most of this shale oil would still be in the ground. It is because the government shrugged at the vast externality costs in pollution and water usage that it entails, and the Fed supplied a liquidity bonanza for wealthy speculators and banks, that the shale boom exists. A+): Foreign oil is largely irrelevant, let Russia and SA niggle over prices with China, where our manufacturing went. US oil production is about the domestic market and our growing export market. Being fueled by cheap credit, it does help make us energy independent, and our allies, who we will support with LNG exports if OPEC/Gazprom tries to get tough. Airline travel and online shopping are taking the demand out of crude, so cheap oil, brought to market on cheap credit is a no-brainer. U.S. Oil companies are not doing well. The cost to produce shale oil requires enormous amounts of debt by the Industry. The only reason the industry hasn’t gone bankrupt is because of low interest rate loans and easy credit. Here is a good article on the shale oil financial struggles. The reason oil prices will drift down is because demand drops whenever it goes over $50 a barrel. The world is saturated in debt. Whenever the price of a commodity that touches everything from food, housing, heating, transports, manufacturing etc..increases, consumption declines and prices are forced lower. Central banks and traders can raise the price, but then we get an oil glut. We’re in a real quandary, oil producers can’t produce oil cheap enough for what the market can afford to pay. When will this comes to a head? Who knows, but it won’t be pretty. U.S. Oil companies are not doing well. 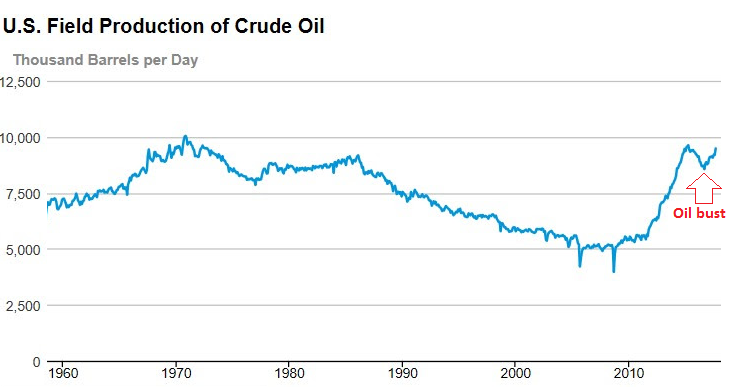 “Peak Oil” isn’t about running out of oil, it’s about running out of cheap easy to get oil. Switch to renewables. Getting cheaper by the day. Dead oil companies sure beats dead economies. Maybe they can all go work on offshore wind farms. Everybody we know that has purchased a new vehicle has bought a big truck. But I am also seeing more houses with solar panels on the roof and more electric vehicles at Target. My millennial says he would definitely consider a Tesla vehicle and a Tesla powerwall in his house. The millennials are definitely open to new ways of doing things. Like literally spending a $100,000 to save $200 on your monthly electric bill and $3,000 a year in gasoline? New way of doing things means not doing any math? You obviously have never experienced a hurricane, flood, or freak winter storm. If you had you wouldn’t like not having power for days or even weeks. I just went through a snow storm here in the south and had no power for half a day and it was no fun. We were lucky the pipes didn’t freeze. Somethings pay for themselves sometimes. You, obviously, cannot do math either. 1. Solar panels don’t work well in the winter (that is geometry with the sun) and don’t work at ALL in a snow storm, covered with snow or with lots of clouds (that is physics). 2. Now try the math game of ROI. Spend $30,000 on a solar system that doesn’t work when you need it or spend $5,000 on an pretty good generator, gas and a transfer switch that works at NIGHT, in a SNOW STORM and even on a RAINY day. 3. Or spend $2000 on a GREAT wood stove that can heat your house all winter long if you wanted – let alone 1.5 days. I’m a fiscally conservative environmentalist, which always puts me in a world of hypocrisy. I have enough dough to write a check for a Chevy Bolt, but I drive a Honda Civic instead. I commute from the coast inland across wildlife management areas and can’t see myself running out of juice in the jungle. Lots of things will happily kill and eat you in Florida. Over the years I’ve invested a lot in high-efficiency machines for the home and my electric bill is really pretty low: $103 this last August. But now it really makes little sense to put in solar. Installation labor doesn’t go down proportionately with fewer solar cells. Millennials can talk the talk. But it takes money to walk the walk. A Tesla Powerwall is a battery storage unit which can be powered by a wall outlet or solar panels. It has a 7 day power storage capacity and 2 units should power an 1800sf house easily. The cost of the a unit installed should run under $8k. For some people, especially people with $10K generators, the Tesla Powerwall is a no brainer. I just installed solar, I do live in SoCal, the return is greater than 10%. And if SCE keeps upping their rates, should get better. Full systems prices have come way down from years of old. My electric bill was about $110/mo. I use off-the-grid solar power to drive a DC pump for irrigation on my farm. Since I irrigate only in the summer time, it’s a perfect fit. The system paid for itself in less than three years. 2 Banana — or you can build a modern, Zero-energy house with the latest technologies — they actually produce excess energy while only costing moderately more than a normal build. “The millennials are definitely open to new ways of doing things”. I have to thank you so very much for posting that link to Micah Tyler’s song. It gave me an hour of laughter and comic relief. It was also satisfying to contemplate Petunia’s reaction to having that final “comment” offered with such 20 mega ton sarcasm.. Rare, elegant defeat in detail. Little room for the foolish on Wolf’s site. All those years of inhaling lead in your gasoline really shows in the boomers these days. It has lowered their IQ substantially…And the human IQ peaks around age 25 and goes into permanent decline. Tesla is as much a creation of debt as cheap money. Even at that his products are very costly. I wrote a blog on this a while back, I thought we would see $65 this year, I had thought mid year/ summer but in the end its been the year end. I think we see $80-100 in due course, not sure if 2018 or 2019. Whats the reason? Capex cutbacks since 2014 leading to conventional private sector production falls. No one seems to be able to predict when but we know the majors have depleted over 10% of their reserves since 2014. $100 oil for a while will really drive more shale and more electric car take up. Nevertheless while the global economy grows demand will also grow 1-2MMbpd/ year. Marginal cost in shale assuming a rebound in margins and wages is probably $75-80, and it has taken higher prices that that to curtail demand. The US is also going towards oil energy independence. Having said all of that a friend of mine is an oil trader and he thinks in the very short term inventory levels could weigh on prices for a bit longer. It is all fine to have compliance at low prices. It will be more interesting to see if compliance is maintained at higher prices. The incentive to cheat goes up as prices rise. Bigger picture is the balance between wind and solar growth versus developing economy demand growth. As wind and solar prices drop the incentive for developing economies to prioritise local wind/solar over imported oil grows. Then there is the inevitable (?) recession ahead … which will not do good things for demand. There was a very large glut. Demand worldwide has been going up much more than production has lately, so the glut should vanish quickly. They focus much more on the United States inventories than they do on other countries. I’m hoping they start talking more about what’s going on in other countries in regards to inventories and stocks, and the bearish and bullish articles will both be posted equally on this site. 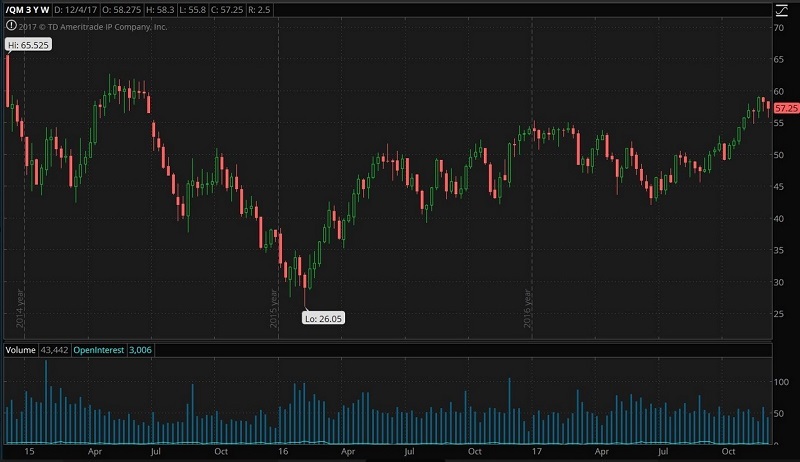 There seem to be widespread shuddering in elite circles when contemplating the possibility of a long-term decline in the price of oil (or any other critical commodity, for that matter). It may be that’s the only break the likes of me will get, in view of the fact that real wages in the U.S. are about where they were in 1966. Observation: This shows yet again how contrived the market manipulation of Oil Shock I and Oil Shock II were. Suggestion: The majority of Americans, like the majority of the people of Venezuela, are being “ripped off” by the export of their natural gas and crude oil in their lowest price raw commodity forms. It is therefore suggested that a export tax be imposed on the export of raw commodities, high enough that raw commodity exports are no longer economically viable, so that domestic jobs and economic activity are generated when semi finished products for export are manufactured, for example domestically processing [export taxed] natural gas into polyethylene pellets which are not subject to export tax. There is also the factor of transportation efficiency and safety. Special ships and cargo facilities are required for the safe transport of NG, while polyethylene pelles are bulk dry cargo, not subject to evaporation and the liberation of explosive vapors. One shipload of polyethylene pellets is equivalent to how many shiploads of liquefied natural gas? It’s not just shale oil, a lot of expensive wells have been capped since the price collapsed. US off shore production costs were $70 a barrel in 2014, but now are reported to be $50. I’m not sure how the cost savings were made, but I suspect it might be by interest free loans. Whatever the reason, as the price rises, the oil companies bring wells back on line. Also the number of rigs operating in the Gulf of Mexico has dropped from 55 in 2014 to 22 in 2016, so the American oil industry isn’t out of the woods. I can’t speak for off-shore, but if they operate like everyone else drilling in the bakken fields the oil companies cut rates 50-60% on most oil drilling, maintenance and transport over the last 2 years. I remember they had so many suppliers comply that a company or 2 even tried getting sports teams to discount their box seats they enjoy so much, I don’t think that worked though(how could they sit in cheap seats with the peasants). Yep. The shale drillers didn’t “improve production methods and technology” like their cheerleaders claim. They made “savings” by arbitrarily (and illegally in many cases) cutting payments to field service companies and royalty payments to landowners. Keep an eye on the Aramco IPO. S.A. is holding off for higher prices in 2018 last I read. Maybe they know something. The Saudi well is dry, well, not quite dry, but getting low. The Saudi invasion of Yemen is to get new oil fields. There are always some suckers, but I doubt if any of those in the know will pay the price the Saudis want. The Saudis have 50-80 years of oil left, they are in no way running out. Of course, they are building 16 nuclear reactors and heavily investing in Solar/wind, plus AI and robotic manufacturing. The new Prince will greatly diversify the economy, creating a new domestic spending boom.